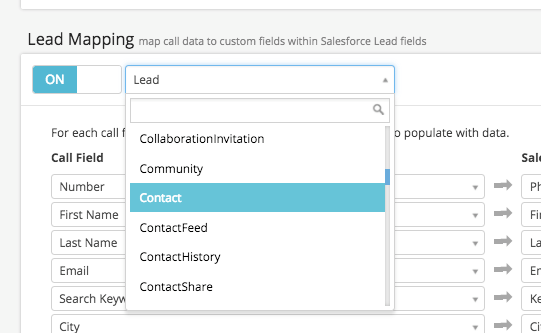 If you do not use the standard Salesforce “Lead converts to Contact” objects, you can select different objects and map the correct fields to them. To get started, click Settings > Integrations and click the Salesforce “Settings” button. On the left, click Field Mapping to scroll down to the Field Mapping section. Click the Update “Field Mapping” button to see the Task, Lead, and Contact Mapping sections. In the Lead Mapping section, if necessary turn it on, and then use the drop down to pick the correct Salesforce object, i.e. Contact or Opportunity, etc. After you select the desired object, you can map Call Fields to Salesforce Fields. If you need to map fields to a different object instead of Contact, you can follow the same pattern in the Contact Mapping section.